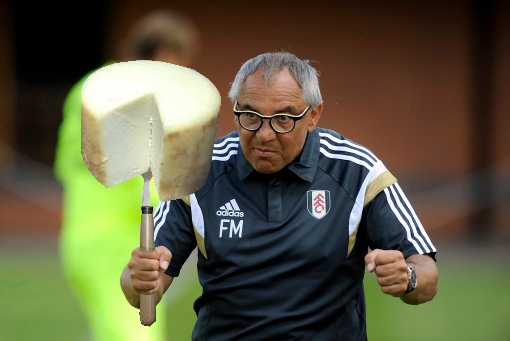 Felix Magath caused something of a dairyquake yesterday when it came to light that the former Fulham boss was keen to harness the “soothing effects of cheese” to help heal his players’ injuries during his time in charge at Craven Cottage. However, it seems that Magath’s methods weren’t and aren’t quite as unorthodox as first thought, with the man himself taking to his official Facebook page to clarify his peculiar cheese treatment. Magath explains that, in order to decrease swelling, he suggested an “old technique of wrapping the knee with quark” (cottage cheese), which is apparently a technique used by several prominent Olympic skiers in the past. “In Switzerland, quark is recommended by some physiotherapists as an alternative to ice for treatment of swelling associated with sprains, etc. “It can be cooled in a refrigerator and then applied to swollen tissues (enclosed in a plastic bag). Fair enough, Felix. Apologies where due, old bean. That’s very good journalism chris. Sorry for being mean to you all this while old bean.